An ideal position is key! The squat is the foundation to everything we do in CrossFit. 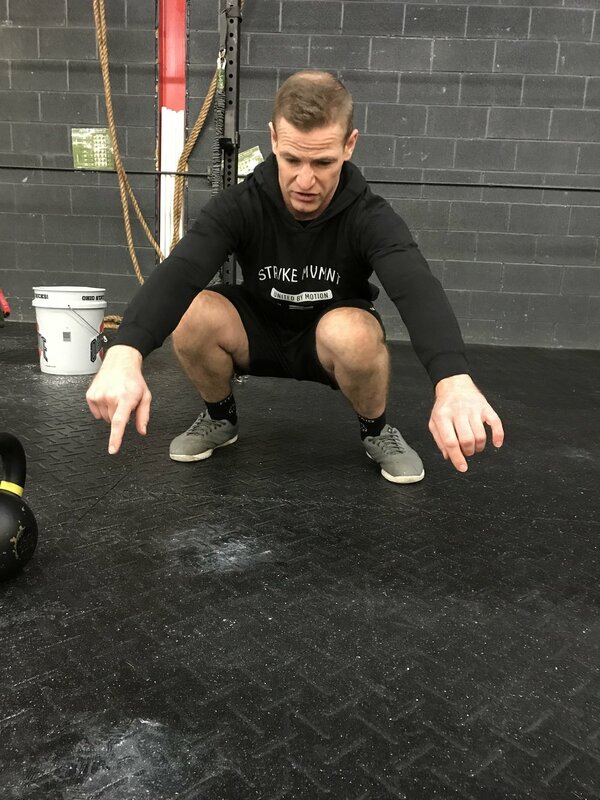 Mobility restrictions or lack of understanding how the body should feel in the squat can take something seemingly simple and turn into a “train wreck”. In an effort to improve your squat, here is some homework for the next 30 days. Every day, spend time in the bottom of the squat and accumulate 10 minutes in a GOOD position. Start small and keep in mind that quality is key. More is not better. Better is better! When in the bottom of the squat an ideal position may be difficult to achieve or hold for long periods of time. It is vital that the time we spend working to improve our squat is done with intention and attention. Work on the following key points. Knees tracking out over the toes. If you can not achieve an ideal position in the beginning DO NOT GIVE UP! Consistent work will get you there. Here are some options to help you along the way. Using a Kettlebell, Dumbbell or plate can help sink you into a deeper squat while giving you a counter balance so it is easier to stay upright. Using a wall or something in front of you is great for feedback on keeping yourself upright. It will also help you focus on being more active through out your entire body to hold a good position. Find a wall and give this one a try! Sometimes you need a little help and that is ok! Just make sure you are focusing on the key points and don’t get lazy. Its easy to just drop down and “do time'“ but our goal is to get better. Focus and work hard. You will see the results. Even is you are only able to hold a good position for 10 seconds. That’s great! Next time go for 15 seconds and keep building.